The Moon will pass over the solar disk in the morning of March 20. The total Solar eclipse will only be observable from a few emerged lands, namely Faroe Islands and the Norwegian archipelago of Svalbard. The partial phases of the eclipse will be well observable from France, between approximately 9:20 am and 11:40 am (local time) on the morning of Friday, March 20. At the time of maximum obscuration in Paris, at 10:30 am, almost 80% of the Sun will be hidden by the Moon. Observing the Sun without protection is dangerous: to safely observe the event, use, for example, the special eclipse glasses. This eclipse will be similar to the more favourable Solar eclipse, because it was total, which was observed in France in the morning of February 15, 1961. In fact, eclipses replicate in a similar manner and at about the same location with a period of 54 years and 33 days. These cycles are named Exeligmos. Few people have observed two eclipses of a given Exeligmos. This will be possible on March 20, for the lucky ones who had already observed the eclipse on February 15, 1961. A large number of tours toward the Faroe Islands and even Spiztberg, the largest Svalbard's island, are organized for enthusiasts of the natural phenomenon of the encounter of the Moon and the Sun on the sky. Observing this event will of course require a clear sky (cloud-free). Tours using ships and jets are both planned. The sky will be crowded at the time of totality. The enthusiasm is overwhelming (there are at least 6 dedicated charter flights). Tides will be particularly strong at this time of the year, because the eclipse occurs near the equinox and the Moon perigee (tidal coefficient of 119 on March 21). International teams will be at work for observing the corona from ground-based sites and in flight, in coordination with observations performed from space by several missions from NASA and ESA, observing with coronagraphs in X-rays, extreme ultraviolet and white light (see Fig. 1). On the ground, several teams will implement their setups at Longyearbyen, Svalbard's largest city, and in different sites of the Faroe Islands. 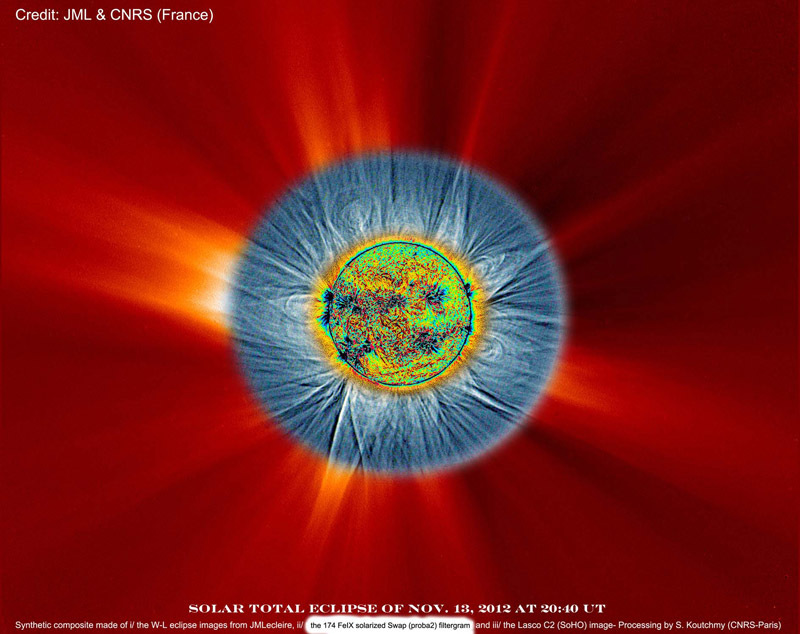 Experiments have been prepared for a long time: imaging of the magnetic corona and the chromosphere at high resolution and for different ionization temperatures; spectroscopy of emission lines to compute non thermal velocities. A team from the IAP will use miniature experiments (imaging and spectroscopy) to study the corona from the ground (Faroe Islands) and from a Falcon 7X. Three such jets will take off from the Bourget and Geneva Airports, as part of the joint stratospheric eclipse flights organised by Xavier Jubier. These jets will fly at 46000 feet altitude along the path of the Moon shadow, allowing, thanks to their travel speeds, to gain one additional minute of totality over the 2 minutes and 44 seconds duration of totality from the ground. More planes will fly during the totality, taking off from different places in Europe, including the Faroe Islands and Svalbard. Fig. 1: Composite image from simultaneous ground and spatial observations, during the total eclipse of Nov. 13, 2012 from Australia : in the center, in false colors, image of the solar disk seen in the extreme ultraviolet (174 Å) by the Proba-2 mission (ESA & ROB) ; intermediate part, in light blue, white light image processed from the composite image produced by Jean-Marc Lecleire ; outside part, in red, simultaneous image obtained in white light with the LASCO-C2 coronagraph of the SOHO mission (ESA & NASA). Fig. 2: Partial phase of the July 22, 1990's total Solar eclipse, seen at Joensuu, Finland, around 04:20 am Local Time.